Microsoft has lifted the curtain much higher on Windows 10, showing off a whole slew of new features that will be coming to PCs and phones later this year. At its Redmond, Washington, headquarters on Wednesday, Microsoft (MSFT) detailed how its new operating system will work across desktops, laptops, tablets, smartphones -- oh, and it's going to use holograms. Microsoft understands that Windows 8 wasn't well-received by customers, and most of its updates to Windows 10 reflect that. It offers a much more familiar experience to Windows 7 users who never made the jump to Windows 8. But it also brings some innovations to the PC that tablet and smartphone users have become accustomed to. And by adding holographic representations to Windows 10, Microsoft is hoping to take Windows to a world beyond screens. "Today really is a monumental day for Windows," said Terry Myerson, head of Microsoft's operating systems unit. 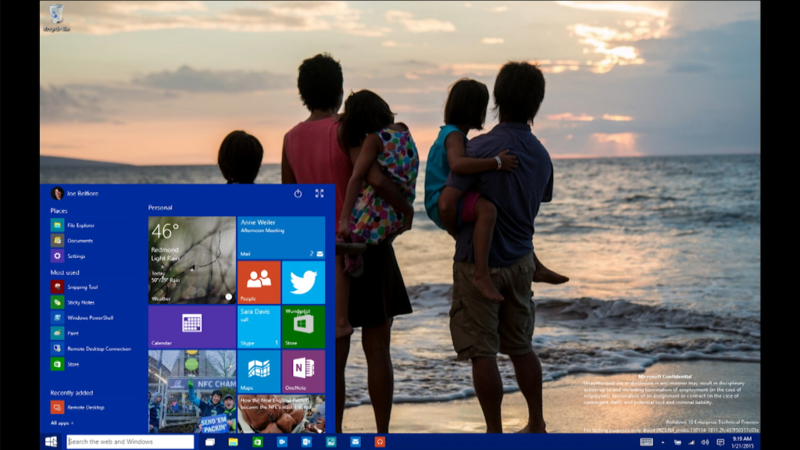 "Windows 10 is so much more than the latest version of Windows. Windows 10 changes the rules of the game." Like a smartphone or tablet upgrade, Microsoft's new operating system will be available as a free update for anyone using Windows 8.1. That's a big deal for Microsoft, which makes a tremendous amount of money on Windows sales. Windows 10 is Microsoft's first major operating system upgrade since Windows 8 was introduced in 2012. Windows runs on more than 91% of the world's computers, according to NetMarketShare. Holograms. By far the coolest part of Microsoft's presentation was "Windows Holographic," Microsoft's attempt to immerse its customers into a computerized world. Windows 10 has been built to integrate holographic representations of its software. With the companion HoloLens glasses, Windows 10 users can interact with holograms all around them. HoloLens comes with a holographic processing chip that understands your gestures, voice and where you're looking. It can map the world around you and display holograms that appear to be in thin air or on objects that surround you. With Windows 10's HoloStudio app, Microsoft lets users create 3-D objects with their voices and gestures (like pinches and flicks) and then print them on a 3-D printer. Cortana. Microsoft's version of Siri will be part of Windows 10. By using voice commands, Cortana can show your notifications, stock information, sports news, and other functions typical of smartphone voice assistants. But you can also say "Hey, Cortana, show me PowerPoint slides about the charity auction" or "show me photos from December," and it will quickly run the search query. No more Internet Explorer. Microsoft introduced a new, stripped-down browser that has been codenamed "Project Spartan." The new browser will ship with Windows 10, and it will function similarly to Chrome and Firefox. Return of the Start menu. After being removed from Windows 8, Microsoft announced that the Start Menu will make a full comeback in Windows 10. The new Windows 10 Start menu includes a new personalizable space for favorite apps, programs and websites. It can be viewed as a full-screen Windows 8-like display of tiles or a more familiar Windows 7-like drawer of apps. Continuum. The biggest Windows 8 headache that Windows 10 is expected to cure is the way the operating system manages its separate "desktop" and "tablet" modes. At its event, Microsoft introduced a new Windows 10 design interface called "Continuum." Windows 10 sticks to desktop mode when it recognizes a mouse and keyboard and tablet mode when there is no keyboard and mouse. But hybrid devices, such as the Microsoft Surface, will be able to transition seamlessly between the two modes. Pull off the keyboard, and you'll enter tablet mode. Snap the keyboard back on, and you're back in desktop mode. One Windows for all your devices. There are currently three different versions of Windows: Windows 8.1, Windows RT for tablets and Windows Phone. Last year, CEO Satya Nadella said Microsoft planned to scaling back. Windows RT and Windows Phone are just becoming Windows 10. Windows 10 phones will be able to live-sync with Windows 10 PCs, and the apps will function similarly across different devices. They'll still be incompatible with most traditional Windows software, but they'll be able to run all of the apps from the Microsoft store. Xbox. Microsoft said the new Xbox app for Windows 10 will let gamers stream and play Xbox games on their PCs. They can also play games from the Steam video game network and save and share game-play clips. A new look for Windows. Microsoft said that Windows Store apps and regular desktop programs will both run in traditional windows in Windows 10. The programs can be resized and minimized from the bar at the top. Windows 10 will feature something Mac users have enjoyed for years: the ability to create new desktops and quickly switch between them. The new "Snap" feature will allow Windows 10 users to work on up to four apps at once on the same screen. Snap has been around since Windows Vista, but Microsoft redesigned it for Windows 10 to include a new quadrant layout. And a new button on the task bar will take you straight to a single screen that displays all your open apps and files.